The Centers for Medicare and Medicaid Services (CMS) recently announced its decision to allow the use of step therapy — a tried-and-true pharmacy benefit management (PBM) technique — to help bring down costs for Medicare Advantage plans for drugs administered under Part B.
That’s good news for payors who are dealing with the rising costs of prescription drugs. Drug prices, both at launch and year-over-year, have been trending inexorably higher at an unsustainable pace. From 2012 to 2017, the price for the top 10 commonly used drugs in Medicare Part B increased at an average of more than 40 percent. The least inflating drug (Alimata) rose 16 percent, while the greatest price increase was for Orencia, at more than a 74 percent cost increase.https://www.pcmanet.org/wp-content/uploads/2018/08/Reconsidering-Drug-Prices-Rebates-and-PBMs-08-09-18.pdf. Commonly Used Part B Drugs with Price Increaseshttps://www.pcmanet.org/wp-content/uploads/2018/08/Reconsidering-Drug-Prices-Rebates-and-PBMs-08-09-18.pdf. The new CMS rule, which takes effect January 1, 2019, enables payors to direct patients who are new to treatment to the most cost-effective, clinically appropriate therapies first, before moving on to more expensive options. 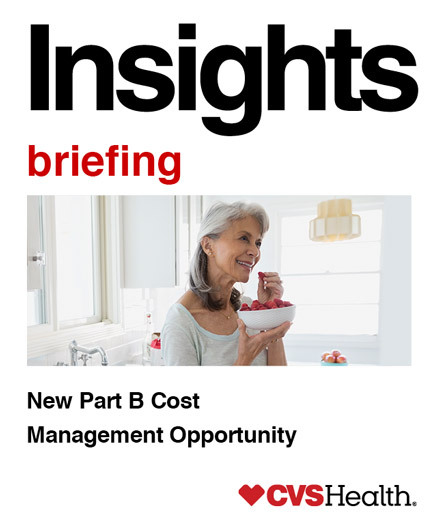 CVS Caremark has one of the broadest sets of integrated capabilities to help manage spend under both Medicare Part B and Part D prescription plans. Our suite of solutions — enabled by our proprietary technology platform, Novologix — can help bring the same precision applied to Part D plans to drugs administered under Part B. Using Novologix, payors can implement core PBM cost-management strategies that help ensure appropriate use for Part B drugs. CVS Specialty helps Medicare Advantage plans ease the administrative burden, limit risk and improve provider experience in Med B management. Step Therapy: Step therapy provisions require that preferred, lower-cost medications be tried first before a plan member progresses to more expensive, non-preferred products. The new CMS rule would allow Medicare Advantage plans to require step therapy for a patient newly diagnosed with a condition. Such patients can be required to begin treatment with a more cost-effective treatment before progressing to a more costly drug therapy if the initial treatment is ineffective, when two or more products are covered by Part B. Plans may also apply step therapy to require use of a Part B product before a Part D covered product. Prior Authorization: Prior authorization (PA) requirements are a way of ensuring physicians are using the best evidence-based rules and prescribing the most appropriate medications for patients. In 2017, we reviewed 3 million PA requests, saving payors more than $2.9 billion without reducing overall adherence. By making electronic PA broadly available, we help plans ease the administrative burden for processing PAs and limit risk, while improving the provider experience in Med B management. Our automated system also enables standard, configurable and/or custom criteria for self-service or delegated PA reviews for Part B plans. Medical Rebates: Medical rebates are discounts negotiated with manufacturers that help ensure certain lower-cost preferred alternatives are utilized first among drugs administered under the medical benefit. In Medicare, effectively 100 percent of rebates are passed back to the Medicare program. We utilize medical rebate strategies for commercial and Medicaid plans in many states today. By ensuring that medical policies, PA, and claims editing are performed through Novologix, clients can achieve the most financial value from our program. The new CMS guidance could allow payors to utilize rebate strategies for Part B drugs that use step therapy to better ensure preferred drugs are prescribed, when appropriate. As market dynamics evolve, strategies that focus on high-cost therapeutic classes can help payors stay ahead of trends. One such category of growing spend is oncology drugs, which make up more than 50 percent of the medical benefit drug spend in Part B.https://www1.magellanrx.com/media/604882/2016mrxtrendreport_final.pdf. The last three approved oral oncology drugs came to market at an average annual price of about $178,000.CVS Specialty Analytics. Drug launch cost based on Wholesale Acquisition Cost (WAC) launch pricing accessed March, 2018. Medispan. To help better manage this category, we are partnering with the leading oncology not-for-profit alliance, the National Comprehensive Cancer Network (NCCN), to offer payors a customizable oncology strategy that enables tighter controls for better cost management. Through our Novologix platform, payors can choose to fully align with NCCN Guidelines or tailor treatment options to drive greater cost-effective regimen selection. We have incorporated the NCCN Guidelines directly into our PA process — and therefore perscribers’ workflows — helping reduce administrative burden and further ensuring that the right drug regimen at the lowest net cost is prescribed from the beginning of treatment. The emergence of biologics to treat a wide range of conditions is another notable market trend of the last two decades. As more biosimilars — clinically equivalent alternatives to high-cost drugs — start to come to market and bring competition to categories dominated by brand biologics, with market monopolies, it creates an opportunity for payors to implement new cost-control strategies. The use of step therapy, as outlined in the CMS memo, can also be utilized for biosimilars that are true therapeutic equivalents of brand biologics covered under Part B. We are utilizing biosimilar competition to generate savings for payors by negotiating better pricing from manufacturers of brand-name biologics, or by offering preferred placement to the lower-cost biosimilar. For instance, Zarxio, the biosimilar for injectable oncology-support drug Neupogen costs about 15 percent lower. The list price for Neupogen is just over $400 compared to just more than $330 for Zarxio. Patients administer one injection per day for varying durations of time. Over the course of treatment, the cost difference could be significant. By giving Zarxio preferred placement and requiring physicians to prescribe the lower-cost alternative first — using step therapy — we can help payors better manage spend. Step therapy can allow Medicare plans to take advantage of current and future biosimilar opportunities in key therapeutic categories including autoimmune, oncology and oncology support, and erythropoietin. CMS also encourages payors to use care coordination in conjunction with cost-control tools such as step therapy. Care coordination and condition management support can be key in helping ensure that patients start on the right therapy and stay adherent to their regimen leading to better outcomes. Our team of more than 300 specially trained AccordantCare nurses can proactively engage with beneficiaries to provide the help and support they need. By addressing any questions or concerns about their therapy, as well as symptom and comorbidity management, they provide holistic care that has been shown to deliver better outcomes — 24 percent decrease in hospitalizations, 8 percent decrease in ER visits — leading to $2,700 savings per engaged member.Accordant Data Warehouse, Accordant Health Services Book of Business, 2016 claims data. Accordant Data Warehouse, Accordant Health Services Book of Business, 2014-2016 claims data for first year clients. The CMS memo offers payors an opportunity to begin evaluating whether their current strategies are offering them effective cost control and what new tools and solutions they can implement for better management of spend. Further guidance from CMS, however, will be necessary before PBMs and payors can take action. Combined with the need for beneficiary notification, this likely means that payors will have limited ability to implement any new cost-control strategies for the 2019 plan year. However, it is important that the planning begin now. We continue to work with payors to identify the solutions right for their Part B plan. We also collaborate with CMS and other industry partners to help ensure the right framework is in place for payors to be able to deploy the most effective solutions to rein-in spend, while providing the best care for beneficiaries. Data Source: CVS Health Internal Analysis, except where noted. *Estimated inflation adjusted price = 2012 price x weighted average manufacturer increase in list price per unit. Not affected by changes in numbers of units per claim, or mix of doses/dosage forms. Analysis included drugs with SSR Health data and Part B spending data for full period 2012-16. PBMs are currently not involved in Medicare Part B program, so no PBM rebates are involved. Drugs are listed in decreasing order of Part B spending. Source: Visante analysis of data from CMS and SSR Health, 2018.